On oddly warm winter days, beekeepers check on their hives. Martin Luther King day I went up and saw signs that my taller hive (the house hive) was doing great. Lots of poop in the snow out in front of the hive (they hold it in while they are in the hive and take advantage of the warm weather to relieve themselves, and what relief it must be....) about three dozen dead bees scattered in the snow, cleared out from inside of the hive. The observation board had plenty of fresh cappings, letting me know where the cluster was in the hive. When I looked in with my flashlight, I got to see the most beautiful cluster, from one side of the frames to the other. It was the first time that I have seen a winter cluster! The sphere of bees widened as I scanned from the outer edge of the hive to the center, and then narrowed again as I reached the other side. When I put my ear to the outside of the hive, I heard a pleasant and reassuring hum. Plenty of stores left, with the top super still full of capped honey. The other hive however, had none of the outer signs of inner life. No bee poop or dead bees out in front of the hive, no cappings on the observation board, and some strange leaking of honey taking place. My fears were confirmed when I looked in with my flashlight. All I could see when I peered down between the frames were loads of seemingly dead bees at the bottom of the hive. No signs of an intruder. Plenty of stores. It will remain a mystery until I take the hive apart. Today, with temperatures going into the mid 50s, I again saw signs of life in front of the house hive, with bees even braving the rain, but nothing stirring from the woods hive. Although I am fairly convinced that the hive is dead, I find myself reluctant to go in there quite yet. I want to make sure that I do so before robbing, mildew or pests get a hold of it though. At that point I can look for signs of disease or starvation. I am sad, and will be even sadder when I have to clear out the thousands of dead bees that I suspect are in there, but I know that this is part of the process. I have heard that typically, one out of four hives don't make it through the winter, so really I have been lucky so far. I miss my girls. I miss their smell and the feel of them landing on my hands to check me out. Next month, the queen will start laying eggs. Slowly at first, just enough to produce enough nurse bees to take care of the burst of young that will arrive when the weather warms with the arrival of spring. I am often awestruck by the realization that they know, on some intuitive level exactly what they need to be doing now, with the anticipation of what is to come. We have so much to learn. 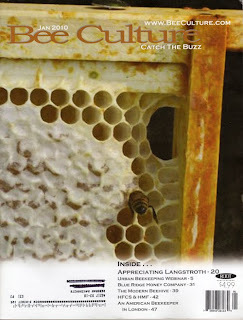 Yes, you are in fact looking at one of our very own Beacon Bees, sucking up the good stuff on the cover of the January 2010 Bee Culture Magazine!! So, how did this happen? Well, back in September I sent in a few photos for their annual photo contest that they turn into a calendar. The theme was "honey" (strange, I know), and I never heard back from them. You can imagine my surprise when I spotted this month's issue on the kitchen table and recognized the photo as mine! I don't quite understand the immense pride I am feeling. Nor can I figure out who I am proud of, myself, or the bee. I told Matt that I feel as if my art made the cover of Art in America! But why? I did not make the bee, or the honey, and the photo was not hard to take. Matt's theory is that it makes me feel like I am part of "the club". That this oddball adventure that I started three years ago has been acknowledged on a higher level, making sense of the money, time and stings that have gone into it. Mostly though, it just feels like a nice surprise. The real satisfaction of being a beekeeper comes while sitting up there on a summer afternoon, hearing the hum and smelling the deep earthy smells of the hive. Knowing that I am providing an acceptable home for these amazing creatures. As far as I know, both hives are still warm and safe, even as the temperatures dip low. Last week, when we had a warm day with a high of 42 degrees, I was able to see girls going in and out of the hive, mostly clearing out their dead. I think about them every morning as I leave the house, and marvel at their (and all creatures') ability to survive the chill that has settled in so deeply. Given that not much is (visibly) going on with the hives right now, I offer you a bit of beekeeping history. 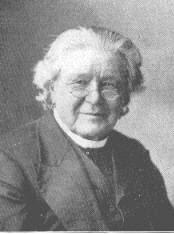 2010 marks the 200th anniversary of Rev. Lorenzo Langstroth's birth. Langstroth was the creator of the Langstroth hive, which is what most beekeepers use these days. His work was groundbreaking in that his hive design allowed beekeepers to remove frames from the hive without destroying what was on them. Langstroth also introduced the concept of "bee space", which is the amount of space that a bee needs in order to move comfortably between frames, while maintaining the preferred temperature and distance between objects. Too much space between frames and a bee will start building burr comb (extra comb), not enough space, and they cannot move around. While most of the big names in beekeeping have been men's, there are an increasing number of female beekeepers, some of whom have been very influential such as Eva Crane and Dee Lusby. I am eagerly awaiting the release of "Piping Up", which is a history of the role of women in American beekeeping, by Tammy Horn. May 2010 bring you much sweetness, growth and sunshine.